I returned to Vancouver last Thursday: the jet lag has now relented, and my brain seems less fogged. We were there for nearly the whole month of May, which was probably not the best choice, since France has no less than four public holidays in May. While we were there we did not drive at all. There was really no need for that. We bought a Navigo Decouverte card, and loaded it with a month’s unlimited travel in zones 1 and 2 – roughly the same as the 20 arrondissements of the city out to the peripherique. Now I am going to surprise my readers by telling you that our system is actually somewhat better than theirs in one respect. If you have a zone 1 ticket or pass here, and need to make an odd trip out to Surrey, you can buy an “addfare”. There is no such equivalent there. 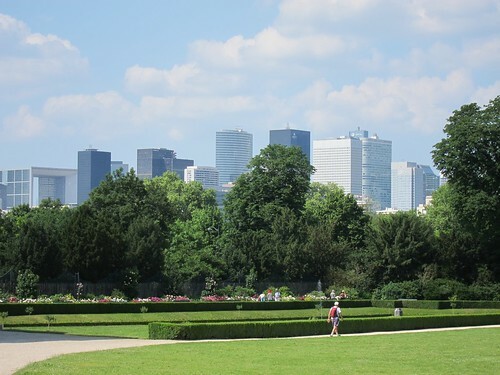 So for a trip out to La Defense (the major office centre, with lots of challenging architecture and lots of public art) which is in zone 3, we had to buy a whole new ticket. It was actually cheaper to buy an all day unlimited Mobilis ticket (€8.55) than a round trip ticket (€10) and we made the most of it by riding all three of the tram lines – most of which are outside the City. The Navigo pass is a smart card with a photo – but you have to write your name on it too. They are very keen on that, though quite how it improves security I cannot say. We made a point of not carrying anything with us like passport or a driving licence which we did not actually need, simply because of the risk of loss to pickpockets. They are a plague of the system – and have been for many years. We saw a successful arrest of small gang, but the general view is one of cynicism that the legal process does little to deter what is a very profitable activity. Pickpockets can easily afford a ticket. Fare checks were apparent – we saw several in the time we were there both on buses and the metro, and each time there were people being given penalty notices. I also learned, from reading a notice in a bus shelter, that there is a free transfer from bus to bus or bus to tram provided that you did not pay a cash fare to the operator, but cancelled a pre-purchased ticket on board. There is no transfer to or from the metro. I suppose this encourages use of Navigo for people who need to get a bus to access the metro. It is a proximity card, which means its use is quicker than the magnetic stripe Mobilis – or any current Translink media (other than the “flash pass”) although I saw a lot of people getting frustrated when the faregate refused to open when an entire purse was dumped on a reader. Navigo is also useful to facilitate use of Velib. There is a daily membership charge, and while the first half an hour of the rental is still “free” after that the Euros start clicking up, so you do have to allow the system access to your credit card. 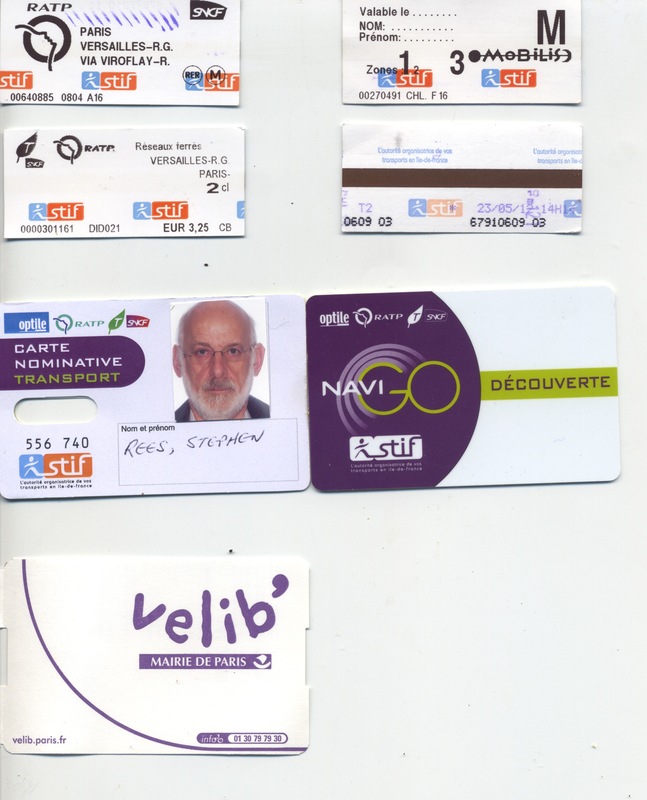 I think it is bit odd that you cannot charge the day membership to Navigo as it is not much different to a metro or bus ride, but of course Velib is a City thing and fares are a regional issue (STIF – the Ile de France agency). So far, and so familiar. 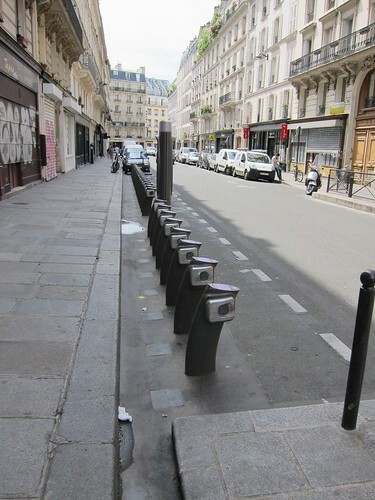 Those holidays – and a spell of warm weather also revealed the shortcomings of Velib – quite apart from the tendency of users to wreck bikes which remain available for rent even though unrideable. More than once planned trips had to change due to the complete absence of bikes – or the complete inability of the system to take back bikes we were finished with, but could not find an open post to lock them back into. I must also report in all fairness that many Parisians do wear bike helmets – though few of them seemed to be Velib users. 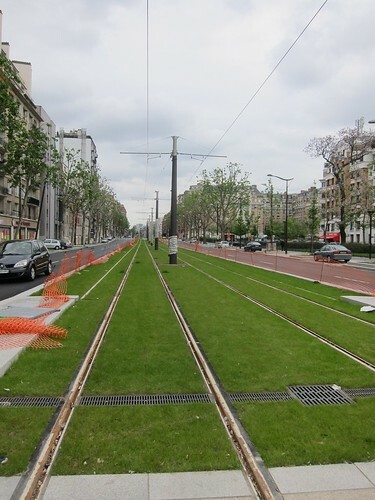 Followers of my flickr stream will also be familiar now with the progress being made to extend T3, the tramway that runs along the Boulevards des Marechaux. These are the broad streets that are named after generals that were built over former city defences on the south and east sides of the city. 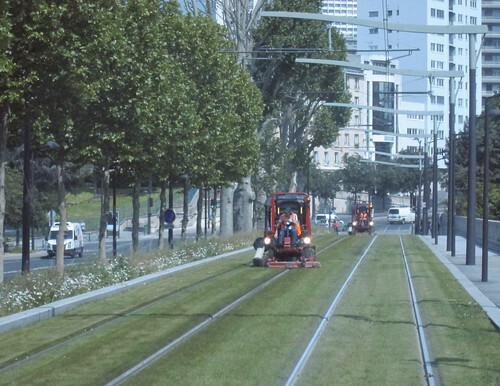 There is, in fact, a disused railway line that they could have used, but they preferred on street running using an exclusive right of way on the median, which is often grassed. There has been a lot of progress in providing bike lanes and bus lanes. I like the bike lanes that run counterflow on one way streets, and also those that are protected from moving traffic by the line of parked cars. I am less happy with the painted bike lanes on sidewalks at major intersections – though there is no argument that these are much safer than fighting motor vehicles on rond points, where priority is simply to those who risk most. We were witness to a number of altercations between bus drivers and white vans at such locations. Bus lanes do not provide a universal panacea to congestion. My partner developed a strong preference for the bus over the metro (you see more of the city that way) but even her loyalty was challenged by some remarkably extended travel times in what looked to me like grid lock – even though Paris streets are not in a grid! We walked a lot too – and found that Paris is, in many senses, quite a small place. The Bois de Boulogne to the Trocadero is about 20 minutes, even at the flaneur’s pace I adopt. 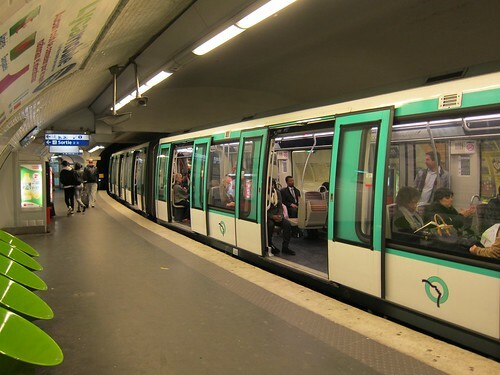 Paris has lots of transit, and is building more. Metro extension is being planned for Line 14 and Line 1 is being converted to driverless operation. Some of the oldest rolling stock is also being replaced with trains that have interconnections between cars (like the Canada Line) which ought to do more to relieve overcrowding. 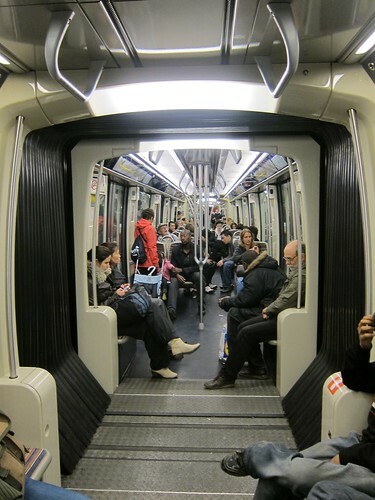 People still seem to prefer to stand near the doors rather than between the seats, which makes them more vulnerable to pickpockets and leads to extended dwell times at stations as people try to get on and off. Much more emphasis seems to be placed on improving commuting to and within the suburbs – with trams, tram trains (line 4) RER and the Transilien services. We made a few excursions on SNCF, and were very impressed by speed, punctuality and reliability of these services. Of course, in this part of the world passenger rail is almost completely neglected by comparison. Nowhere gets it right all the time, and there is no monopoly on truth. No one transit system answers every need. But the balance between cars and other modes is different there than here, and is closer to what is needed now, and will be even more important in future. Paris does need to get tougher on cars, I think. They have some experiments with street closures. For instance around the canal St Martin at weekends. But that is still exceptional. For much of the day traffic in Paris is slow moving: parked cars and deliveries are a huge unresolved issue. After hours, parking still seems to be a free for all. While car drivers do seem to respect the need to leave garage entrances clear, pedestrian crossings and street corners are seen as perfect opportunities to park, once the traffic wardens have ended their shift. There is also an extraordinary ability to get into spaces that no Canadian would even attempt. Paris is not my favorite city as, like many Bordeaux natives, I much prefer London —but after at least 30 odd trips there, my first one when I was 14 —I grew to like it. Re your passport..I hope that you had at least a photocopy of it…it not you were lucky…or have a trusty look than even a French cop can like. The French themselves MUST carry an official ID card at all times. Paris metro used to have 8 zones and only has 5 right now. There are serious talks about having only one zone soon…either this July or next year, especially now that the Socialists are in. You can charge a Velib subscription on a Navigo pass but ONLY on the Navigo for Paris residents. It cost 29 or 39 Euros per year–depending on what you need–right now. One can also buy a ticket for 1 day or 7 on the internet in advance of a trip. As far as tight parking goes, the trick is to slightly nudge the cars in front and back…they will move as hand brakes are usually left partly off. 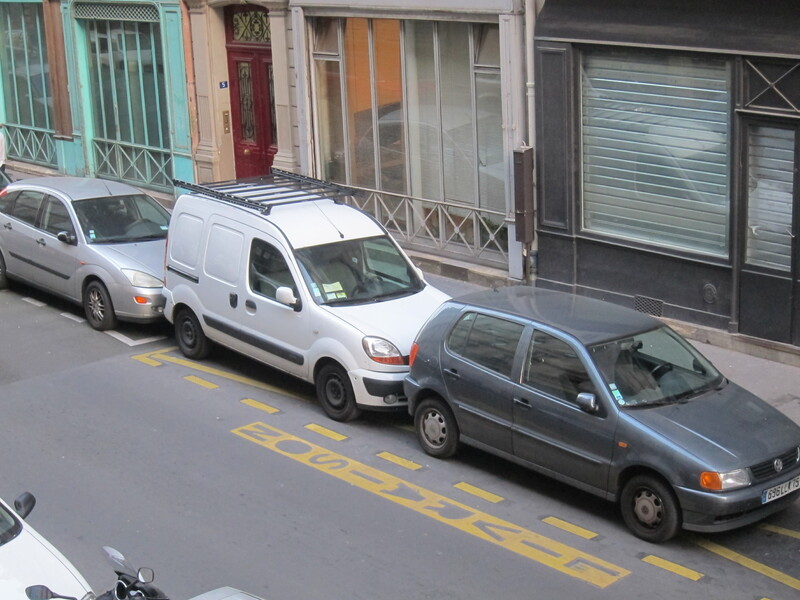 When I lived in France–a small town but parking was a problem there too–my car got 4 perfectly symmetrical dents (one at each corner)–within a month of getting it brand new. For those here not familiar with Paris and planning to go, Trip Advisor Paris Forum has some great advice. I have no financial links or otherwise with them at all..honest..and don’t even like their format and their agony aunts censors but the info is great. Many of the usual posters are North Americans that know Paris very well indeed. Paris is like London and other big places…at rush hour on the subway or the RER one realize how lay-back life is in Vancouver… but there are still very peaceful streets in downtown Paris. We have always been treated nicely (I let my friend—born in Asia and with a minimal knowledge of French–do all the talking. I only talk when both parties are stumped). Just don’t expect waiters, stores staff etc. to be all over you as if you were long time buddies. Formality rules. Even long time work mates call one another Mr. X or Mrs Y and more often than not will use “vous” (second person plural). Mind you saying “bonjour monsieur” –or madame–when first talking to a waiter, store staff etc. will break the ice and if they can speak English they will. Pickpockets are unfortunately a big problem in Continental Europe. I have seen young women that got caught stealing scream at the cops, calling them racists etc. Many of the pickpockets are young and are more or less allowed to be in France, Italy etc.. They are victims themselves and MUST steal daily or they will be roughed up. My buddy and I prefer to avoid the most touristy areas…but then we saw all these spots many times in nicer days. Keeping valuables–not that one should carry much–close to the skin is nearly a given.. When in the Metro, or in a street crowd, you day bag–small please!– should be carried with a strap around the neck and the bag on your chest, with arms around it—yours mostly, though you may see someone else arm on it at times…. We stayed close to the Canal Saint-Martin near Hopital Saint-Louis. Please go to my photo stream on flickr to see the pictures. A small selection were added most days and I am getting around to post the rest over the next few weeks. We found accommodation through Vacation Rentals by Owner and I wrote a glowing review there for the place where we stayed. We used the Lonely Planet City Guide but did not carry it with us. The apartment had lots of reference materials and really good wifi. I have a wallet that is strapped to my belt and then tucked inside my trousers. No-one gets in there without me knowing! We carried very little so we did not need a “day bag”. And my camera was in my hand most of the time. Thanks Stephen. Your apartment was in a good location. Much less touristy than the low number districts, more down to earth..
Love your photos. It does seems that the number of tourists everywhere has increased a lot. I think that it started in 2000 and even the airport security check hassles don’t deter people. The Buren columns in the Palais Royal are one of my favorite work of art. Giving plane trees a military haircut is an old tradition in France. On some roads all that is left in spring is a trunk with a wood ball on top, no branches. Until 15-20 years ago? lawns in public parks, squares etc. were off-limit to everyone everywhere in France. As a kid living downtown I grew up playing on the gravel paths, not on the lawn, and still don’t like to walk on lawns in formal French gardens. I am pretty sure that in the 17th and 18th centuries the French aristocrats weren’t keen at all about walking on the grass either…They, like the Italians, liked artificial landscapes that looked artificial. Check http://carnavalet.paris.fr/en/collections/la-place-royale-vers-1660-passage-du-carrosse-du-roi. click on the link then on the painting to make it bigger…no one on the lawns. Nope, we can’t have nice things in Toronto. Oh no. Interesting, because if there is one thing that says “North American Living” it is the lawn. Albeit in a suburban tract, but… lawn on the street? Why not? Do you know if they mow it? Stephen’s picture makes it seem a lot more appealing than the shots you see in the train manufacturer’s literature. 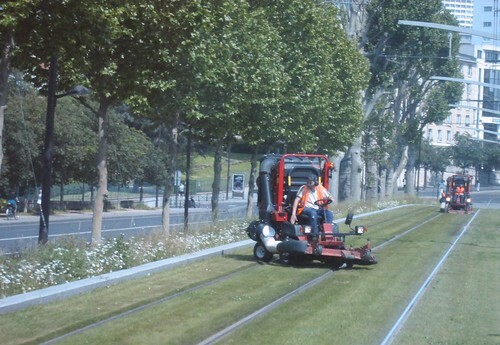 of course its real grass and of course they have to mow it regularly.